The structural test article of the European service module for Orion is being assembled at Airbus Defence and Space. Airbus is building the module, which will supply the spacecraft’s power, in-space propulsion and air and water for the crew, on behalf of ESA (European Space Agency) for Orion. The STA is being transported to Glenn Research Center's Plum Brook station for testing. A critical piece of NASA's Orion spacecraft — which may carry astronauts to deep-space locations like Mars — is about to begin a series of crucial tests to determine whether or not it can withstand the rigors of spaceflight. 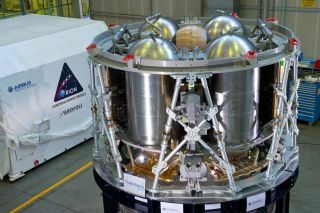 The Orion service module, built by the European Space Agency, provides propulsion for the Orion vehicle and critical life support to the crew, among other things. On Nov. 7, a test version of the module was delivered to NASA Glenn Research Center’s Space Power Facility (SPF) at the Plum Brook Station in Sandusky, Ohio. The facility will test how the system will withstand the intense shaking and thrust associated with a launch, as well as the heat and pressure extremes it will encounter in space, among other things. NASA's Orion space vehicle will launch atop the agency's Space Launch System (SLS) rocket, and has the capability to take human astronauts on journeys to the moon or possibly Mars. Orion underwent its first test flight on Dec. 5, 2014, but during that test, the craft was not fully equipped for a trip into deep space. Sometime in 2018, NASA plans to launch Orion on a fully integrated test flight known as Exploration Mission-1. That flight will take the uncrewed vehicle around the moon. Among the tests that the service module will undergo at Glenn Space Center will be an acoustic stress test and a mechanical vibration test to simulate the launch environment, as well as shocks tests to mimic the vehicle's separation from the rocket. The facility hosts a vacuum chamber that is 100 feet in diameter and 120 feet tall that will mimic the vacuum environment in space. The facility will also fire pyrotechnics to test the temperature resilience of the vehicle's solar arrays. "That testing is going to identify any risks that we haven't gone through, any design problems, any potential failures, right here in a controlled environment on the ground," Free said. "And that’s the best place to find those issues — before we're in flight." The service module serves many purposes for Orion, according to Mark Kirasich, manager for the Orion Program. It acts as the propulsion system, provides steering and avionics for the spacecraft, and during the ascent from Earth, it "gives the spacecraft an abort capability, should we have a contingency," Kirasich said. In addition, it has solar arrays that are used to collect energy and power all the equipment onboard Orion, including radiators that keep the temperature ideal for both the equipment and the passengers; it also carries oxygen, nitrogen and water for crew life support. "As you can easily understand, the ESA service module is a critical element of Orion," Kirasich said. "We aren't going anywhere without it." Kirasich said that after the series of tests is completed at Glenn Space Center, the service module will be disassembled. Some of the remaining parts will be refurbished and undergo further testing, with some sent to Kennedy Space Center in Cape Canaveral, Florida, while other parts will return to Europe, where additional iterations of the service module are being constructed. Two representatives from the European Space Agency spoke at the press briefing yesterday: Nico Dettmann, development department head at ESA, and Oliver Juckenhoefel, vice president and head of the European Service Module program at Airbus Defence and Space (ESA's corporate contractor for the module). Juckenhoefel spoke extensively about the need for collaboration in order to make an optimum vehicle, adding, "NASA cannot fly without us, and we cannot fly without them." When it was announced that ESA would build Orion's service module, the agency said the module would likely cost several hundred million dollars, but would be delivered as an in-kind contribution. No agency has stated definitively if ESA's contribution of the Orion service module will guarantee that ESA astronauts will fly on Orion missions. "It's obviously the ultimate objective to have an ESA astronaut flying beyond low-earth orbit, and we hope that this cooperation will actually lead to having a European astronaut on such a mission," Dettmann said. Greg Williams, deputy associate administrator for NASA's Human Exploration and Operations added, "This is going to be an international endeavor on this long journey to Mars, and we would love to see astronauts from several nations be involved when we first set foot on the Red Planet." Follow Calla Cofield @callacofield. Follow us @Spacedotcom, Facebook andGoogle+. Original article on Space.com.